A water-resistant smooth opaque flexible PVC banner with a tear-resistant polyester fabric embedded between two white vinyl layers and a non-glare finish. A water-resistant, durable and economical polypropylene film with a non-glare finish. Also available with permanent / removable pressure sensitive adhesive. A water resistant 100% polyester fabric with a repositionable self-adhesive backing for easy application to a wide variety of surfaces and easy removal without leaving residue. Does not rip, wrinkle . . .
A water resistant 100% polyester fabric with a repositionable self-adhesive backing for easy application to a wide variety of surfaces and easy removal without leaving residue. This opaque version is optimized for . . .
A water-resistant, durable and economical polypropylene film with a non-glare finish. With a permanent adhesive. 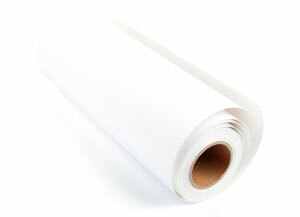 A water-resistant, durable and economical polypropylene film with a non-glare finish. With a removable adhesive.